I’ve been setting parameters for digital hillshade for years. And loving it. 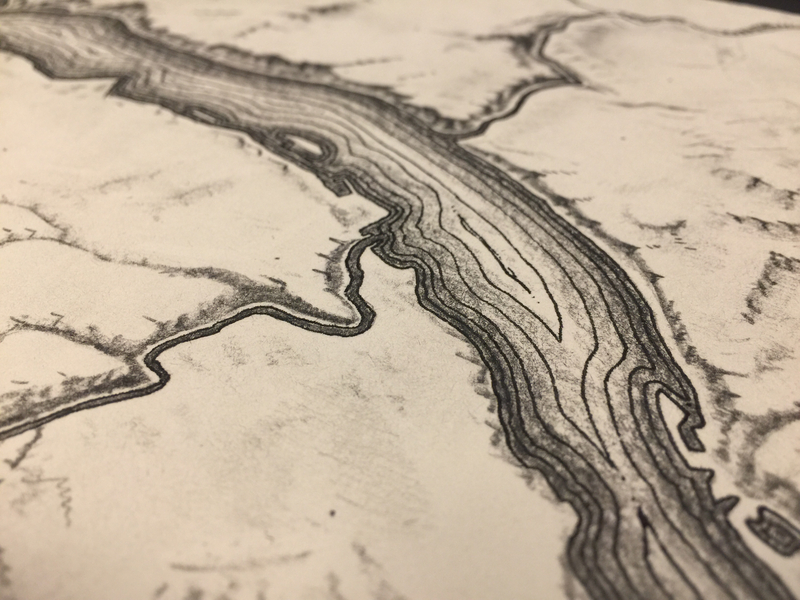 But when I got a close look at an actual graphite-on-paper sheet of hillshade from an unknown cartographer of the past I felt…jealous. This was the remarkable work of a master. And it was laid down with their mind and hand. The ideas about best virtual light source positioning were ultimately flexible to them as they constructed a third dimension in their considerable working memory and scraped what they saw in their mind’s eye onto paper. It was remarkable and I have thought a lot about it since. Especially since for a time it was my desktop image. 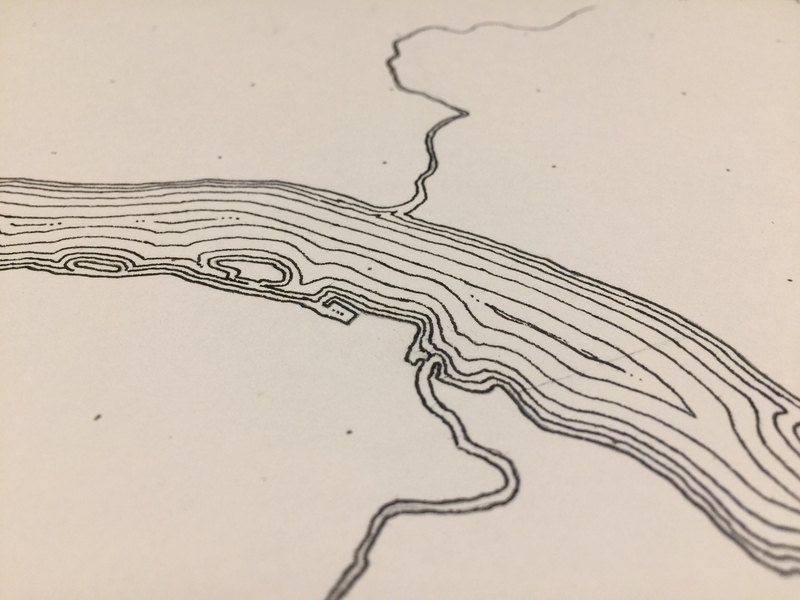 So this year, as a gift to my sister and her family, who live in the particularly resplendent topography of the Columbia River Gorge, I thought I would try out hillshading by hand. Like an actual cartographer. I had the paper already from a previous project. And I had the pencil (cheap, fine graphite mechanical pencil) and pen (fine tip Pilot). 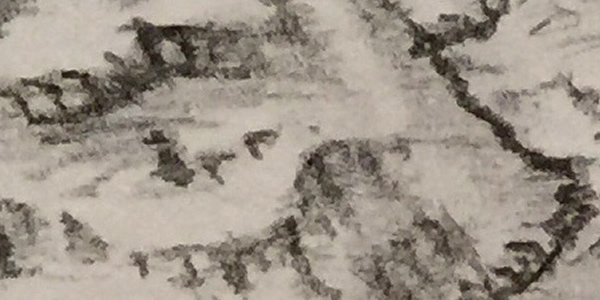 The paper, which is dense watercolor paper, has a more textured side. I flipped it over to the back so the surface was smoother; I knew I’d be shading with pencil and didn’t want the aggressive texture of the paper to co-opt any penciled-in texture. 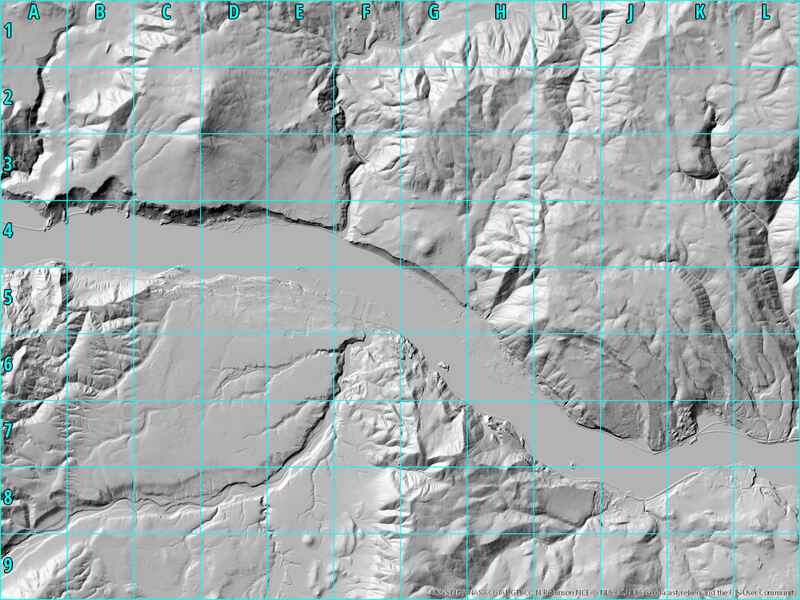 I created a reference hillshade image in Arc and gridded it up, and I made a matching grid on my paper. 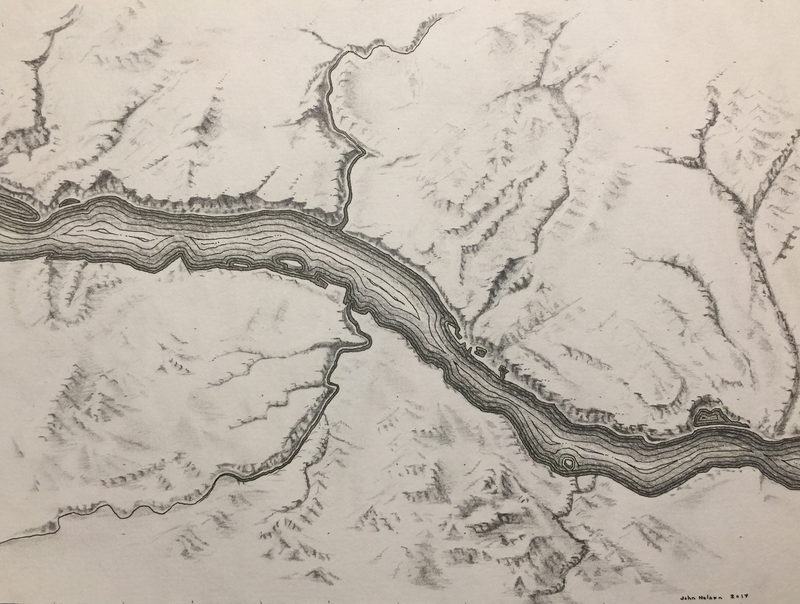 I penciled in (followed by a pen tracing) the shape of the Columbia River and the main tributaries within view, the White Salmon River (north) and Hood River (south). I’ve been especially obsessed with waterlines lately. I was pretty excited to get them pulsing in this map. So I traced the inner river’s edge over and over with a slight increase in each ring’s spacing. It’s a throwback effect and I really enjoyed the process. It went pretty fast, actually. You know, I was half-tempted to leave it right here. 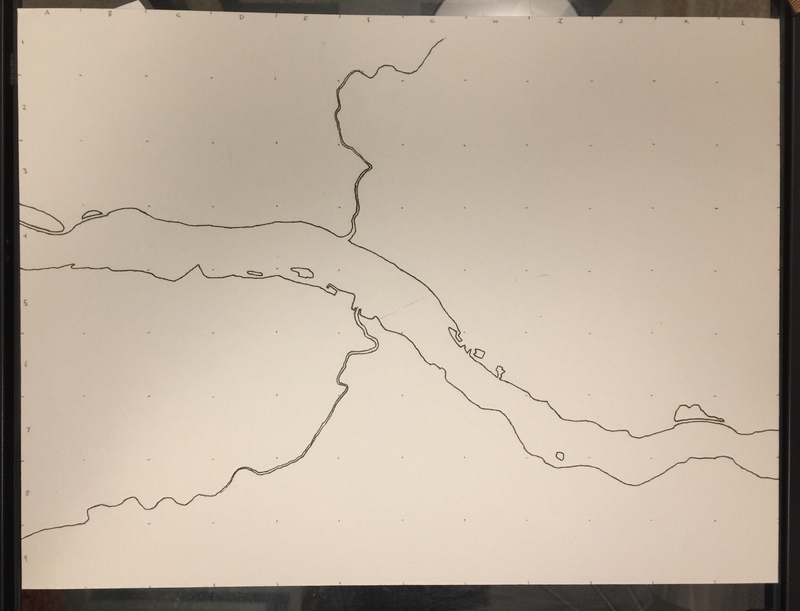 A minimalist map of the Columbia, in vintage waterline style. And I might do that some other time but I was too eager to try out hillshading to stop now. In hindsight, I would separate these two effects into two different maps. They sort of clash, in my opinion, and raised an aesthetic challenge that I’ll describe near the end. Anyway, it was on! Time to tilt that pencil and start scrubbing in some shadowy graphite. 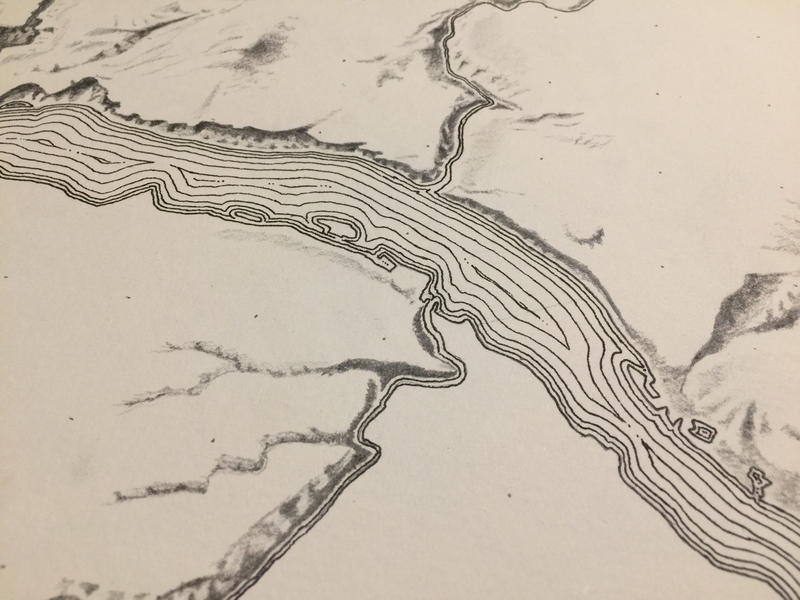 I found that hillshading is an elusive state of mind. I would find myself getting into a focused groove, where the imaginary NW light source did its work and I dutifully etched the shading in. But more often than not I was struggling to maintain a consistent technique and consistent shadow direction. A fun struggle, but it was like exercising only to discover sore muscles that you didn’t know existed. My hillshade muscle was nascent and took a few very different directions. But, one plugs away. I’ve learned from drawing a lot as a kid that if you are in the realm of shading, stay there as long as you can. The shadier the drawing the better. If you look around you can see different patches where I was trying out different hillshade textures, with varying amounts of success. The hardest part was in finding, and sticking with, something cohesive. But I did really enjoy the process of finding and riding an effective mental state, losing it, and trying to find it again but in a pretty different aesthetic. Over and over. Eventually I found that I could unify the hillshade textures a bit by adding in an imaginary stepped-craggyness trick of a backwards “r” angle along what I presumed to be ridges. Eventually the hillshade looked reasonable enough that I felt comfortable calling it quits. That when to stop thing is a fickle sensation for any creator. Eventually you just blow the whistle or you’ll go nuts. 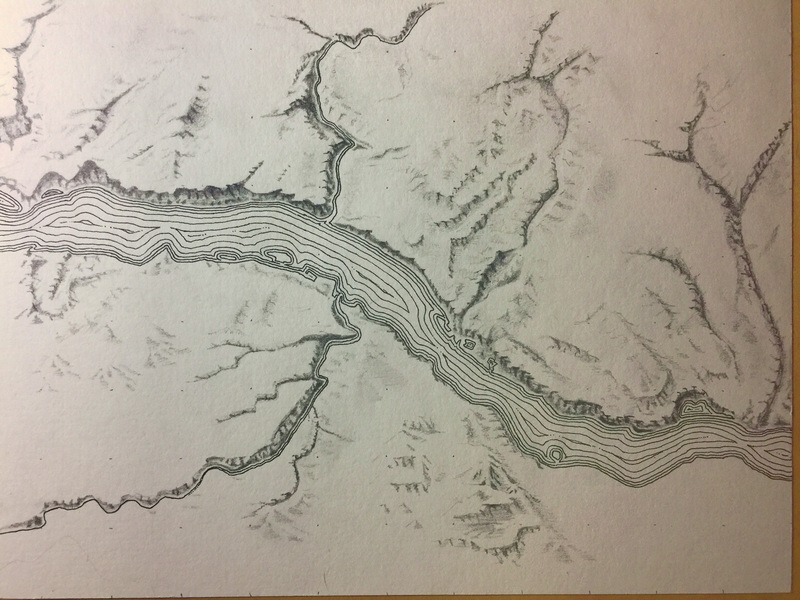 At this point, I had a waterlined river in pen and hillshade in graphite. And boy did they not really belong on the same map. Here’s the aesthetic challenge. Darker shading means steepness in hillshade. But denser waterlines don’t mean anything that literal, they are a ripple effect to help darken/denote water. When seen concurrently the river buzzed a little because my brain wanted to interpret the shallow river edge with deepness. I was inked into a corner so I just went with it. Oh well. As long as Carol likes it then that’s all that matters. 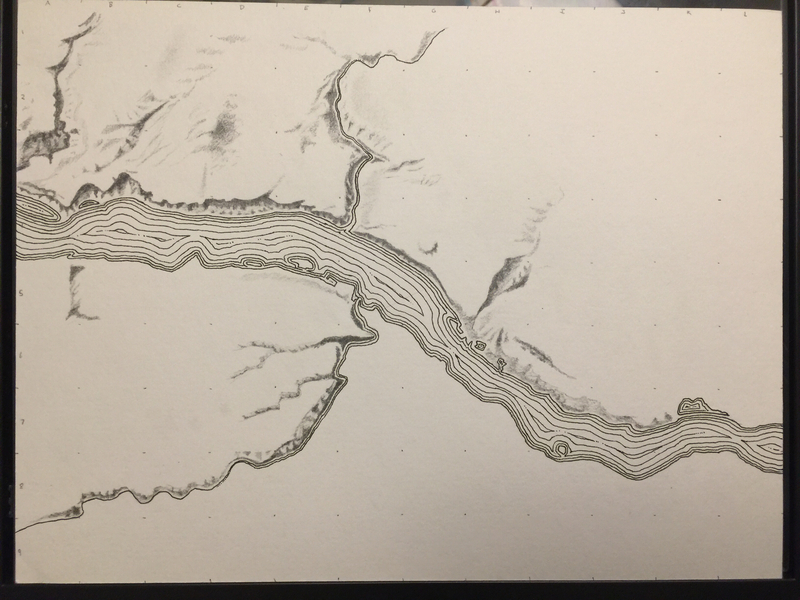 So I blended in some pencil atop the waterlines so the river wasn’t so stark and different. I like it enough. 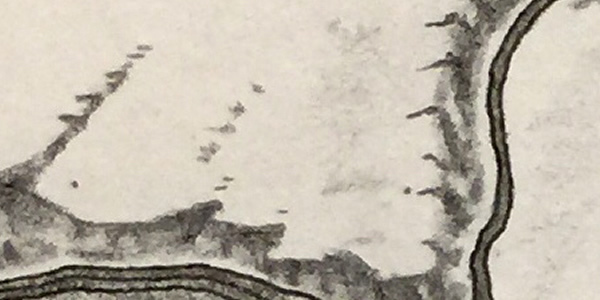 Maybe in hindsight I would have left the south edge of the river free of pencil shading. The act of holding a pencil and trying to create a false sense of dimensionality was so interesting. And exciting. Also tiring. 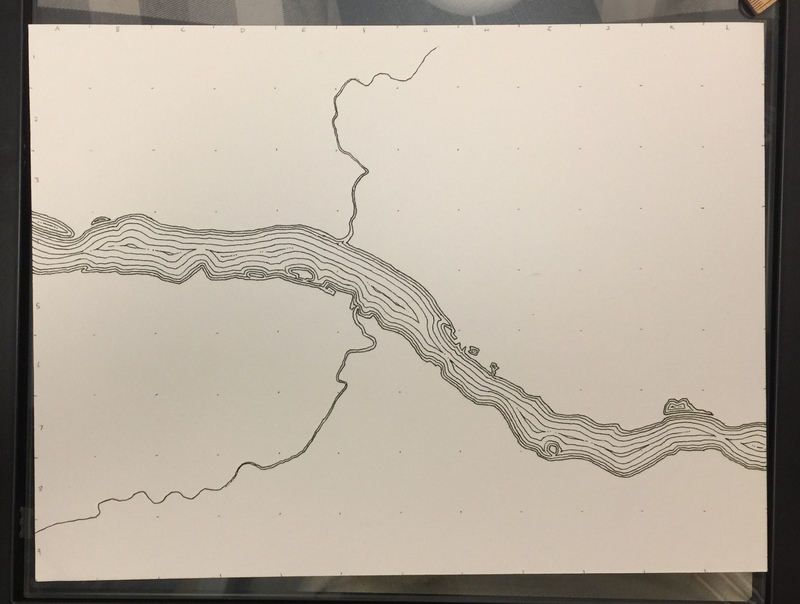 I felt like I had a connection to cartography in a way that I never have when doing all sorts of weird things with elevation data in a digital domain. It was a tangible process with physical materials and felt like a building process. Establishing a connection to a creative process is elusive and important. This was a new dimension for me and one that informed, or at least exercised, the little hillshade bits of my brain. No doubt this will lend perspective to my use of digital cartography tools. 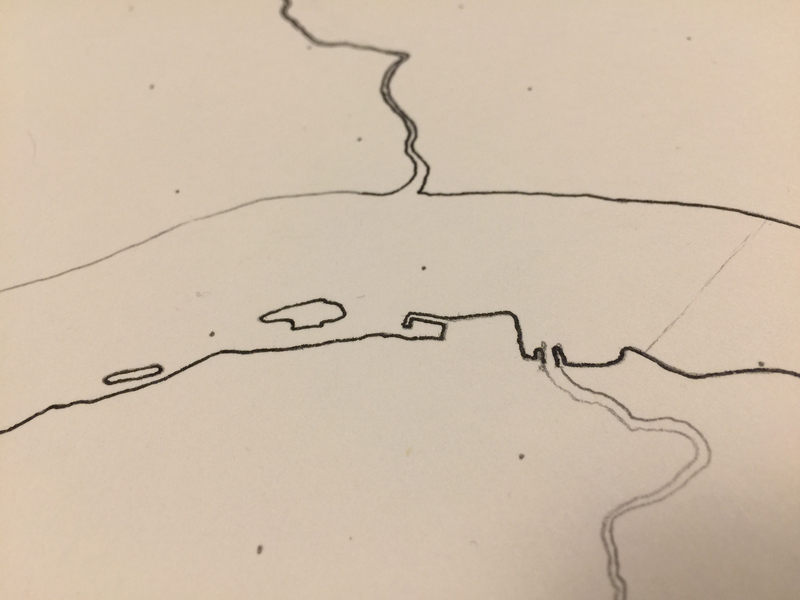 What’s more I have a slightly clearer connection to the work of cartographers before me and the analogue/digital barrier between us feels a little thinner. That’s pretty fun. 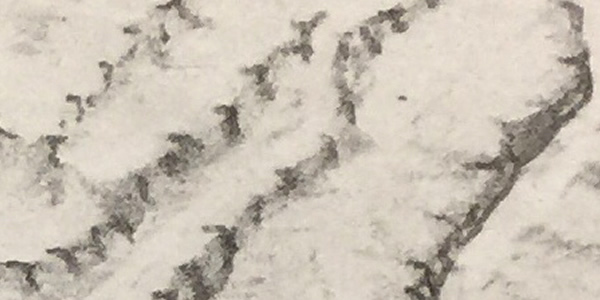 In the last couple of maps, you’ve started out by drawing grid dots. Is there a preference with that method vs using a light table and a generalized map as a base? It takes a couple minutes to draw a grid and I don’t have a light table.